Allison Stroud’s four-in-hand competes at the 2018 Live Oak International. Photo: Bianca McCarty. Live Oak International, which takes place March 7-10 in Ocala, Fla., offers world-class competition in two sports: driving and jumping. The driving event is one of the largest driving competitions in the United States, and the jumping competition, the $100,000 Longines FEI World Cup™ Jumping Ocala, is part of the prestigious North American League. But there’s a lot more to know about this unique competition. We’ve got you covered with 10 fast facts, including live stream information and how to buy tickets to attend in person. Ocala, Fla. – Combined driving athletes will descend upon the majestic Live Oak Plantation this week for a shot at a USEF Combined Driving National Championship title. Live Oak International, running Thursday, March 15 through Sunday, March 18, returns as the host for the USEF Advanced Four-in-Hand Combined Driving National Championship and welcomes four new USEF Intermediate Combined Driving National Championship divisions. The 2014 Alltech FEI World Equestrian Games™ individual silver medalist and 2012 FEI World Driving Championships for Four-in-Hand individual silver and team bronze medalist Chester Weber (Ocala, Fla.) looks to extend his USEF Advanced Four-in-Hand Combined Driving National Championship record. He will harness his powerhouse team of Splash, Jane Clark’s 14-year-old Dutch Warmblood gelding, and his First Edition, an eight-year-old KWPN gelding; Boris W, an 11-year-old KWPN gelding; Asjemenou, a 12-year-old KWPN gelding; and Reno, an eight-year-old gelding, as he chases his 15th national title at his home farm. However, the 2017 USEF Advanced Combined Driving Four-in-Hand Reserve National Champion Misdee Wrigley-Miller (Paris, Ky.) will be in hot pursuit with her Beau, an 11-year-old KWPN gelding; Bravour 54, a 10-year-old KWPN gelding; Bolino D, an 11-year-old KWPN gelding; Calipso 86, a 10-year-old Dutch Warmblood gelding; Daan 8, a 10-year-old KNHS gelding; and Saco, an 18-year-old Dutch Warmblood gelding. Both join championship veterans James Fairclough (Newton, N.J.), 2012 FEI World Driving Championships for Four-in-Hand team bronze medalist, Paul Maye (Fairfield, Va.) and Allison Stroud (Kennett Square, Pa.) as well as newcomers Wiebe Dragstra (Southern Pines, N.C.) and Mary Ruth Marks (Verona, Wis.), who will attempt to win their first title. Scott Adcox (Myakka City, Fla.) and Shane Doyle (Hillsborough, N.J.) will go head-to-head for the USEF Intermediate Pair Horse Combined Driving National Championship. 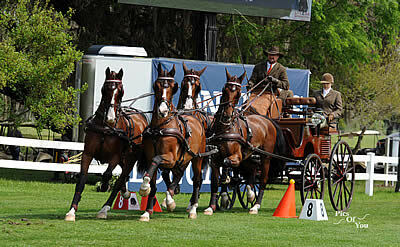 Adcox has competed in single horse combined driving events for the past several years. He will compete in his first pair horse division for at Live Oak, entering Nupafeed Auto Pilot, a 13-year-old KWPN gelding; Nupafeed’s Leap of Faith, a 14-year-old mare; and Pepe, a six-year-old KWPN gelding. In the largest combined driving division at Live Oak International, 11 athletes will vie for the USEF Intermediate Single Horse Combined Driving National Championship. Taylor Bradish (Windsor, S.C.) won the preliminary single horse division at the Palm Tree Combined Driving Event at Little Everglades in January with her own Katydid Duchess. She makes the leap with Katrina Becker’s nine-year-old Welsh Pony Cross mare to the intermediate division aiming for her first title. However, she can expect tough competition from veteran drivers including 2014 FEI World Para-Equestrian Driving Championships for Singles individual silver and team bronze medalist Bob Giles (Morriston, Fla.), 2010 FEI World Singles Driving Championships competitor Robin Groves and her husband Wilson Groves (Brownsville, Vt.), Anna Koopman (Middleburg, Va.), Cathy Thomas (Verona, Wis.), and Marcie Quist (Vass, N.C.). Robin Groves won the FEI Single Horse Division at Live Oak International in 2009 and placed second in 2011, while Quist placed second in the FEI Single Horse CAI2* at the 2017 Live Oak International. Katie Whaley (Paris, Ky.) and Esther “Boots” Wright (Ocala, Fla.) will battle it out for the USEF Intermediate Pair Pony Combined Driving National Championship. Whaley is the 2016 and 2017 USEF Advanced Pair Pony Combined Driving National Champion. She will compete with her own Welsh Cross pony geldings Tommy, 14 years old, and Tanner, 11 years old. She also brings along her five-year-old Teddy to give him experience as he is not old enough for Fédération Equestre Internationale competition. Six entries make up the USEF intermediate Single Pony Combined Driving National Championship division. Jennifer Keeler (Paris, Ky.) has won every single pony combined driving event she has entered and aims to keep that streak alive with a title victory. She brings her Zeppo, a six-year-old Hackney gelding. Janelle Marshall (Williston, S.C.) has only finished outside the top three twice out of 13 single pony combined driving competitions. She brings Kennebec Joyce, John Merritt’s 10-year-old Morgan mare. Others competing in the division include Nancy Dimick (Randolph, Vt.), Jackie Kane (Hudson, Mass. ), Tayler Roundtree (Auburn, Calif.), and Kristin Whittington (Edinburgh, Ind.). Photo courtesy of Scott Hodlmair. Ocala, FL (March 12, 2018) – The most decorated whip in American driving history, 14-time USEF National Four-in-Hand Driving Champion, Chester Weber, predicts the “best ever” in equestrian competition at this year’s Live Oak International, March 15-18, at Live Oak Plantation in Ocala, Florida. The Live Oak International at Live Oak Plantation is the only show in the United States to offer both Combined Driving and Show Jumping, and this year’s event will be home to seven US Equestrian National Driving Championships, as well as the final leg before Paris of the 2018 Longines FEI World Cup™ Jumping North American League, the $100,000 CSI-W3* Longines FEI World Cup Qualifier. As for his chances at reaching his competitive goals, Weber knows what it takes and that’s what “drives” him. “It feels like I need to work hard all the time. You make your luck, right? The harder we work, the luckier we get.” Weber’s strategy for the upcoming three phases of the four-in-hand championship include veteran KWPN campaigners Splash and First Edition (lead), Boris, and Asjemenou for Dressage and Reno replacing Splash for the Marathon. This combination of horses is the team that Weber hopes will make him a top contender at FEI World Equestrian Games to be held this September at the Tryon International Equestrian Center in North Carolina. But first the focus is on this week at Live Oak International. But the deft competitor and cagey host, won’t reveal all his plans, for on course or under the VIP tent, where this year’s Saturday Night Party coincides with another celebratory date: St. Patrick’s Day. “There may be a few mint-green outfits. Anyone with any great ideas can let me know,” Weber added with a wink, but this is one leprechaun who isn’t giving away his pot o’ gold secrets to his party’s theme quite yet. “What I can say is that a Live Oak Party always promises to be outrageous.” Prior years’ themes have included a suave 007, big top circus, and swash-buckling pirates. Since its founding, the Live Oak International has grown into one of the most recognized equestrian events in North America and draws some of the best in their disciplines from across this continent and Europe. Two of this year’s new achievements will be the debut of a sand Grand Prix arena, using GGT All-Weather footing, and virtual hosting of The Flanders Foal Auction in the VIP tent on Friday, March 16. This is the first time the Belgian-based sport horse auction and its elite European bloodlines will available to the United States. Every day at Live Oak International promises a front row to the competition, including the popular Marathon phase on Saturday, March 17th. For more about the event and an opportunity to see Chester Weber and his fellow competitors in action, visit www.liveoakinternational.com. Ocala, FL, (USA), 12 March 2017 – As the final pair to enter the turf field at Live Oak International, the USA’s Todd Minikus and Babalou delivered a commanding, double clear performance to win the $100,000 Longines FEI World Cup™ Jumping Ocala, the closing leg of the Longines FEI World Cup™ Jumping 2016/2017 North American League season. Until Minikus crossed the timers at 47.77 seconds, Germany’s Andre Thieme and Conthendrix held the lead as the seventh pair to ride in the 18-horse jump off. Thieme stopped the clock at 49.39 seconds with zero faults across the shortened track. France’s Alexandra Paillot rounded out the international podium with a third-place, double clear finish aboard Polias de Blondel. Their round clocked in at 51.68 seconds. From a starting number of 38 entries, nearly half of the field went clear in the first round over a fair, yet testing, course built by Bob Ellis (GBR). The first round featured 13 obstacles and 16 jumping attempts, with triple and double combinations. Ellis also utilized the field’s slope to test adjustability, scope, and carefulness at strategically placed verticals and wide oxers. It was the final round that highlighted the day’s top combinations when only five pairs jumped double clear. Galloping lines and rollback turns asked multiple, difficult questions that caused rails to drop throughout the course, particularly at a careful vertical that followed on a bending line from the Longines oxer. After a streak of faults in the riding order, the odds looked to be against Minikus to ride clear. But proving that the best had yet to come, he seamlessly and efficiently rode through tight turns to find the correct distances and came away with the coveted win. Noticeably missing in the jump off were 2016 Rio Olympics pairs Ben Maher (GBR) and Tic Tac and Scott Keach (AUS) and Fedor, with four and five faults, respectively. And the winner of last year’s event, Marilyn Little (USA), also narrowly missed advancing with an unlucky rail in the first round. The rankings have decided which 14 riders have earned bids to the Longines FEI World Cup™ Jumping Final in Omaha, Nebraska (March 29 – April 2). The top seven athletes from the East Coast (USA), top three from the West Coast (USA), and the two best-placed athletes from Canada and Mexico have qualified through the Longines FEI World Cup™ North American League. Longines FEI World Cup™ Jumping – check out the latest on www.fei.org.